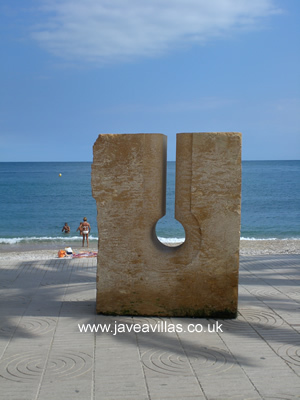 Javea Port is about a mile and a half drive from the Arenal beach. 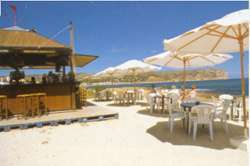 It has its own beach, La Grava, which although not of the same soft sand is still very pleasant. 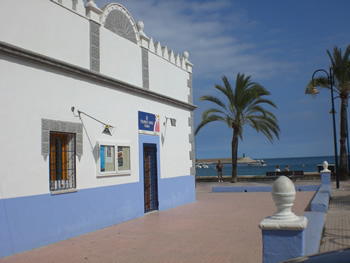 The attractions aren't limited to aswim in the sea, there's some really nice bars serving tapas, a great bookshop, an active fishing port, and a very nice relaxed atmosphere. Whilst this part of town is visited by tourists it feels very much a Spanish Community full of shops, bars, restaurants, pharmacies, and a couple of decent sized supermarkets as well as La Grava beach. This is where the Fiestas take place - like the Festival of the Port in September or the Christians and Moors fiesta which recreates the reconquest of Spain. 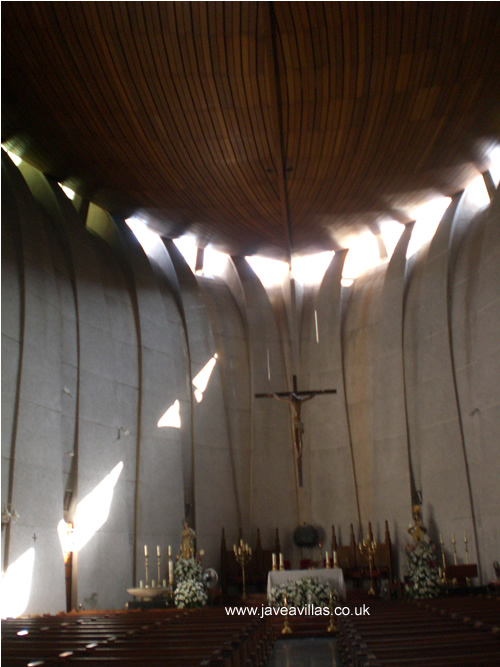 Even though I am not a fan of modern architecture, the Church is well worth checking out.From the outside it looks like a complete monstrosity, a real concrete nightmare from the seventies, but there is logic behind it! Have a look at the shape of the roof from the inside (pictured left) - it looks like the hull of a boat - in recognition how it came to be designed, built and paid for. The fishermen of Javea were out at sea when an almighty storm broke out. It was so bad and went on for so long that they ended up praying to Nuestra Señora de Loreto and pledged that if they were saved they would raise funds to build a new church for her. Right opposite the bookshop is one my favourite Restaurants, El Posito (for more info go to the Javea Restaurant Guide), good for fresh fish and a relaxed atmosphere. It is right on the front so you get a lovely sea breeze if you dine there on a warm Summer evening. It's also a great place to watch the Moors and Christians festival. The Javea Tourist Informationis located here too, right next door. 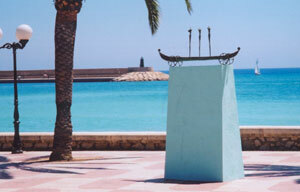 I have a lot more pictures of Javea port so I have put them on a page for you that opens in a new window. There are at least three really good tapas bars here just near the church. 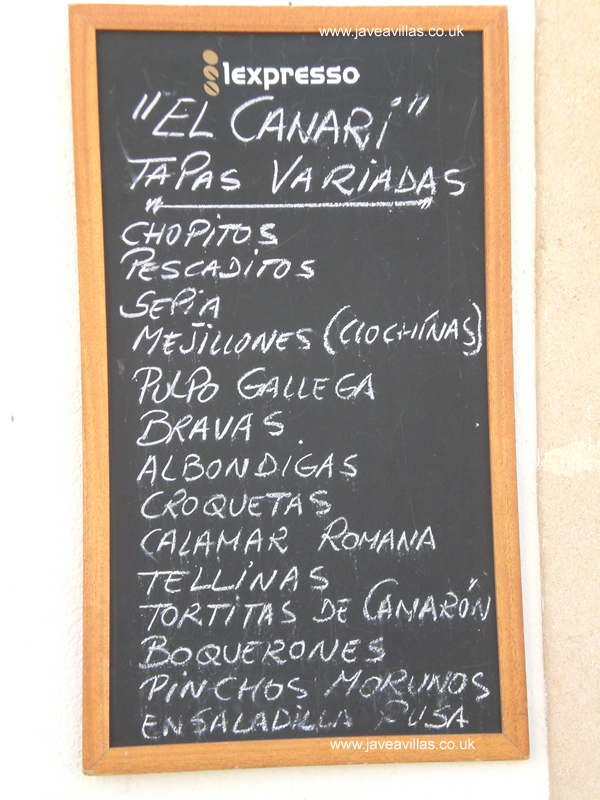 If you want to see a tapas menu from El Canari it opens in a new window, click on the picture on the right. 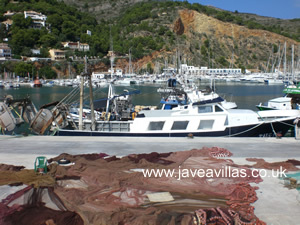 Javea still has a working port and you can see the boats coming in most days. Walking along the quayside is where the picture of the port at the top of this page was taken. 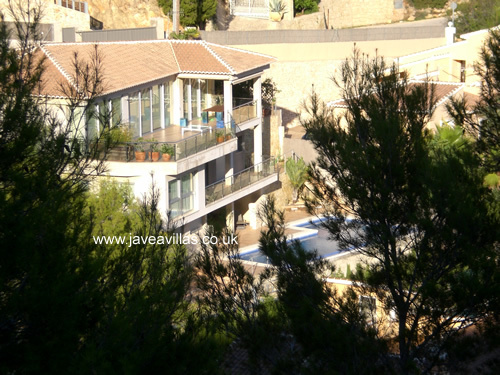 Above the port are some fantastic villas. It's a tremendously steep road to get up there but the views are simply fantastic. 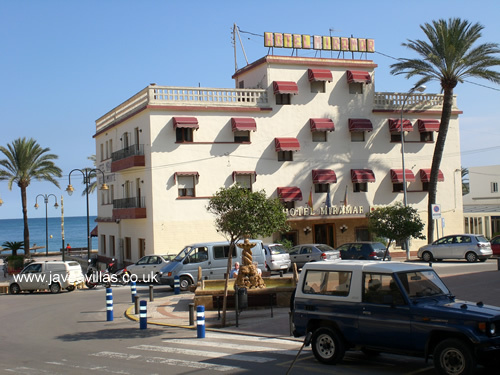 There are a couple of Hotels down here in the port - Hotel Javea and Hotel Miramar. The Mirarmar only takes bookings of a week in the summer season but you will be hard pushed to find a hotel with better views. The Javea Hotel is more of a Pension style, but has a reputation for being clean and well run. Taking the road West from the Port you will pass about six "chiringuitos" which are Summer Bars open from Midday till about 4am which are a great place for a cool late night drink - they have music playing and are populated almost exclusively by local Spanish people and are a great way to end the evening - the sound of the waves lapping the shore and an ice-cold G & T.